Conveniently located on St. Josephs Avenue, close to the heart of Dublin, we are the closest self-storage facility to the north side of Dublin City. The newest Storage comapany in the City. Our Self Storage units for rent in Dublin offer all commercial customers a free service where we take deliveries inwards and put deliveries outwards for you also. 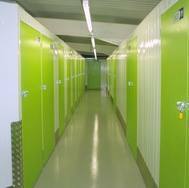 We provide secure self-storage units for homes and businesses in Dublin. You will benefit from having 24 access to our storage facility, which is fully secured with modern CCTC and security alarms systems. Our customers benefit from 24 hour access and our premises are fully secure, with alarms and CCTV. Along with storage services, we prove a wide range of packing supplies. We even offer a transport and removal service 7 days a week for your convenience. Please contact us anytime if you have any questions while browsing our website. Storing with us is like having extra business premises around the corner or having an extra room to the rear of you house or apartment. We have individual storage spaces to rent ranging from 10 sq ft to industrial spaces of 500 sq ft. You choose which room size suits you best and how long you need to store for. If you suddenly need more space, (or less space) you can change room size whenever you like without penalty. Store your equipment, documents or extra office furniture from as little as seven days or as long as you like. There are no long-term commitments or complicated leases to sign. So rent storing space for less and longer with us! With so many furniture removal companies around, we know it can be hard to decide which one to trust with your treasured possessions. That’s why every Dublin City Storage works closely with a small number of trusted companies they can recommend to customers. We constantly monitor feedback our customers give us about these companies, to make sure we’re always working with the best operators. We’ll be happy to arrange a furniture removals company or a man-with-van for you when you get a quote from us. Whether you’re moving down the road, or far away, pack and travel with care. Make sure all the boxes are labeled and colour coordinated for easy identification. Pack up together valuable, delicate or small items like ornaments. But remember to store china and breakables in strong cardboard boxes, packing with plenty of bubble wrap, tissue paper or loose fill. Don’t use newspaper, as the ink will stain. We sell a range of packing boxes, bubble wrap and packing tissue in store and online. Assign a specific box for items such as coffee, tea bags, sugar, toilet roll, towels, scissors mugs, kettles etc and mark the contents clearly. In another box, pack common cleaning products such as brushes, bin liners, dustpans, and repair items. To enable easier lifting, always store heavier items in smaller boxes. Books would be a good example of this. Always plan your route, checking for roadworks and ensuring you have a full tank of petrol before you leave. Try your best to avoid moving on bank holidays and Fridays, as this is the busiest period for removal companies. Mid-week off-peak times will always guarantee a less stressful and productive move. Make sure your valuables are fully insured for transit. Some moving companies provide this option but you should always check for exclusions and have them covered yourself appropriately. Not all items may be covered by the removal agencies’ insurance policy. Also if you are planning to transport and high value items yourself, check to see if they are covered also. Not sure which unit size is best for you? Click here to find out more.